Luchadoras 3 – Lady “Lucha Libre” Wrestling Returns to Motorco Music Hall in Durham ~ February 25th! This Saturday lady wrestling in “lucha libre” fashion returns to the Motorco Music Hall in Durham. The previous two events have been sell outs so get there early to get your tickets. This is a family friendly event. Check out the video at the bottom of this post for scenes from Lucharodas II back in January. LUCHADORAS have taken a firm stranglehold on the Triangle, selling out consecutive shows with a dizzying display of tactical wrestling and acrobatics. The growing buzz and widespread fanfare are evident each time the expanding team of masked female wrestlers take the ring. Each Luchadora has committed to further researching the history of lucha libre to ensure a proper tribute is issued each time they put on their mask. “LUCHADORAS 3” is sure to be another installment of memorable excitement as Motorco Music Hall welcomes veteran and incumbent Luchadoras. The exuberant Mexican wrestling spectacular that marries astonishing acrobatics and exhilarating aerial maneuvers with flamboyant masked characters and outlandish story lines will be on display, Saturday, February 25th at noon. In Mexico, lucha libre (free wrestling) rivals soccer in attendance, and boasts a 75-year history of imaginative, family-friendly entertainment. The tradition of wearing masks dates back to the Aztecs and the designs are meant to evoke the power of animals, gods and other ancient heroes. The “luchador” or wrestler takes on that identity and the mask is so sacred that to wager and lose one’s mask in a battle is considered a disgrace. Like the first two events, LUCHADORAS 3 will bring the well-loved Mexican tradition to Durham with a slight twist – only female wrestlers will be permitted to compete. The 3-hour daytime spectacle will feature numerous one-on-one matches, tag team bouts, and entertaining intermissions involving crowd participation. Additionally, patrons will have an opportunity to consume authentic Mexican street fare from famed area taco truck Captain Ponchos Tacos, drink some “Los Luchadores” coffee from Counter Culture prepared by bikeCOFFEE, and to meet and greet their favorite Luchadoras after the event. The Luchadoras’ costumes have been assembled using recycled materials from Durham’s beloved Scrap Exchange, while Fanaticmasks of Carrboro camouflages many of the athletes with their authentic, North Carolina-made lucha libre masks. 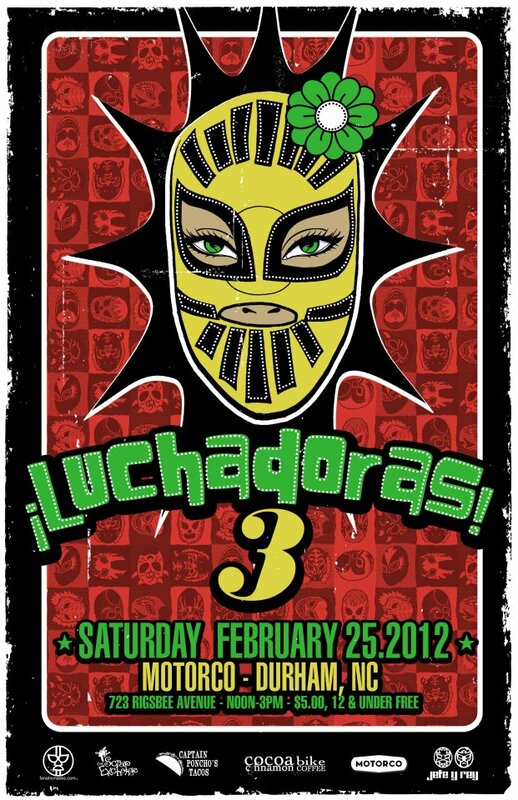 LUCHADORAS 3 will benefit the NC Dream Team and the Inter-Faith Food Shuttle. NC Dream Team, is an organization composed of undocumented immigrant youth and allies dedicated to the creation of a sustainable, community-led immigrant rights movement in North Carolina. The group aims to help undocumented youth recognize their individual and collective power to activate their communities, working to achieve a just reform that is acceptable to–and guided by–the voices of those directly affected by our broken immigration system. The Inter-Faith Food Shuttle, is an organization committed to pioneering innovative, transformative solutions designed to end hunger in our community.